The MIH Ted Talk Goes Live! 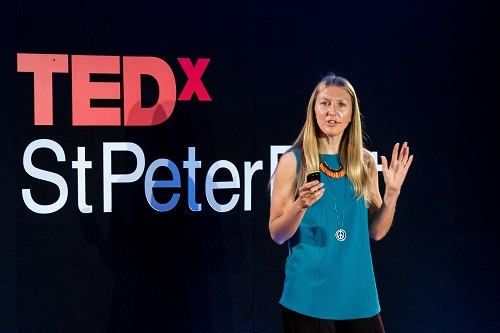 From the moment the Dandelion Project in Guernsey asked me to be part of their annual TedX St Peter Port 2017 event my heart was beating faster than normal. Of course I initially tried to appear casual but in reality there's something about the power and branding of a Ted event that puts the pressure on - big time. As my friend and seasoned public speaker Minna Salami from MsAfropolitan told me later, "No matter how brilliant the talks you do are afterwards, it's always your Ted that follows you around." Yikes. The purpose of the event is that the speakers the Dandelion Project bring over to the channel island are supposed to bring ideas with them that could be implemented locally, the grand vision being they want to make Guernsey one of the best places to live by 2020. Also the small size of the automous channel island means progressive, new and dynamic ideas can be put into practice relatively quickly and then used as a case study to initiate global change. Pretty cool. Now I really enjoy public speaking and usually take it in my stride, especially when speaking about MIH. After all, having set the project up, it's not like I can get anything majorly wrong or people can really challenge me about what I'm saying. But now the project is so much bigger than me the pressure to portray the amazing work and effort put in by the teachers, team, volunteers, supporters and participants has added a layer of responsibility and subsequant anxiety to do a good job. But a Ted Talk - crumbs, we could really use this as a vehicle to spread our message. The overiding thought that kept flashing through my head over the coming weeks as I planned it was, "I cannot f**k this up. I cannot f**k this up." On repeat. Not sure how helpful that was. I looked into professional public speaking courses but could not afford any of them from the big names. I did score a great free phone coaching session which was useful for tips but what I really needed was someone to work with me on creating the talk content and structuring the narrative. I wrote a few versions late at night after putting my toddler to bed and finishing all my usual MIH work. Ideal right! Bits of the talk I liked but other bits I knew just weren't popping, but I couldn't seem to work out why or work out how to change it. I had sooooo much to say and yet I knew I had to squish it all into 18 minutes otherwise the talk would not get uploaded onto Ted's main website. Ahh pressure. I also, shock horror, can't use PowerPoint or Prezzie or anything like that so Radhika one of our amazing volunteers and board members was putting together slides for my ever changing and evolving narrative. Not at all a pain for her right? Thanks Radhika! Just days before I was due to travel to Guernsey I met up with the amazing Marianne Cantwell from Free Range Humans. Marianne had recently done a very impressive Ted Talk called The Power Of (Not Always) Fitting In and watching it, although exhilerating, gave me the major wobbles. This was seriously slick. It was clear Marianne had considered so many things that hadn't crossed my mind. Camera angles, what to wear, make up, openers, empathy, gosh even choreography. Now there was no time for me to delve into all of that (although I did indulge in a panic shopping trip to buy some 'grown up' looking plain coloured clothes from a very unethical high street chain - forgive me! ), but there was time for her to do some drastic slash and burn on my talk opener, which she did whilst I sat like a guppy fish thinking, "OMG I can't change it now." I will be eternally grateful for Marianne's boldness in telling me I had to change my opener and put myself in the talk. Because it was about Made In Hackey I hadn't put a single drop of myself in it. That just felt too self indulgent and not relevant. Marianne did not agree. I twisted my face into various awkward expressions whilst she said, "Look, for the sake of the rest of the team and volunteers and everyone you need it to be good - so you need to put yourself in it. OK?" Errr, OK? A few very late nights later (toddlers have no appreciation for Ted deadlines - yes really can you believe that?) the talk was in a shape I felt happy with and I pottered off to Guernsey on the ferry rehearsing my talk like a very insistant broken record. The team in Guernsey were so gorgeous and did everything they could to put all the speakers at ease in the run up to the event. They hugged us, a lot. Took us for dinner. Made sure all the fellow speakers connected. Man I even got a surf in! The big day arrived and try as I might I couldn't concentrate on anyone's talk that was on before my own - regardless of how fascinating all the topics were. As I got mic-ed up and shuffled towards the platform and the infamous Ted red dot (stay within the circle!) I knew my hands were shaking and I felt pretty sick, my stomach plummeting to my toes when the Ted water drop ident was played on screen. You know the bit you see before watching the most amazing, moving speech like ever in the world? Yeah that drop. Stop the bus I wanna get off! But then, yes, of course, I did it. All that prep and stress and panic whizzing by in 18minutes. I felt silly afterwards as to quite how worked up I'd been. I also felt pretty ashamed about what a total b*tch I'd been at home for the last few weeks and certainly owed hubby an apology, who was sitting outside in the creche with the little man on full partner support duties. Now the talks online I can obviously see a heap of things I'd like to do better, to change, would add in, take out, blah de blah blah blah. I'd particularly like my face to not be shining like a beacon, but hey the small charity budget doesn't stretch to pro make-up artists, and rightly so. I'm sure you'll enjoy watching it, as you'll do so without any of the baggage and nonsense all Ted Talkers carry with them every time they play their Ted moment back to themselves - if they can bare to watch it back at all. So here it is. Please watch, share, comment and get it out there as best you can. Because 'The World Needs Community Kitchens' . It really does. And me being awkward about the talk shouldn't stop that message getting out there should it?